The small oasis of Ain Amur lies half way up on the escarpment outlining the Kharga depression. 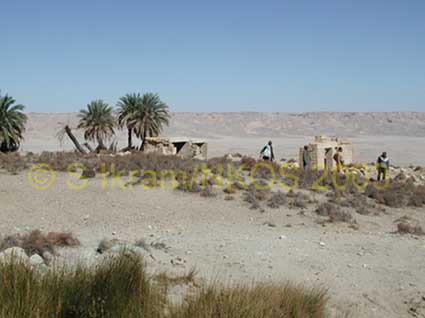 It was a resting station and the only water source along the Darb Ain Amur, that linked Kharga and Dakhla. Its fresh water source is still used by people and animals. The archaeological remains consist of a Late Period stone temple surrounded by a thick, irregular enclosure wall. A large cemetery is located to the east. Unfortunately, in the recent past both the temple and the cemetery have been severely damaged by looters and tourists.